Prepare your rib band first and determine the best length and width for your band. Read Determining the Length and Width of Rib Bands. Step 1. Zigzag baste the raw edges of the rib band together. 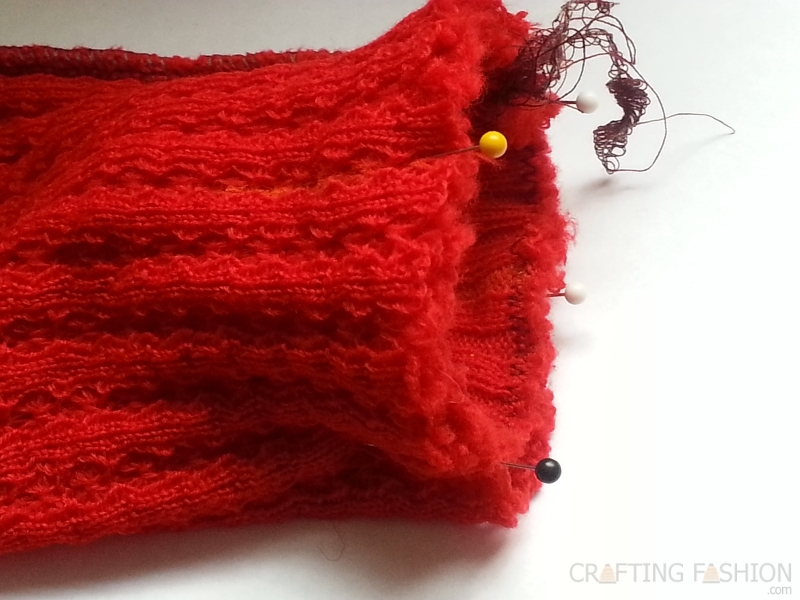 Start at the seam and carefully match rib for rib as you sew. I use about a 4 mm width and a 4 mm length on the sewing machine. (I sometimes skip Step 1 entirely.) When the basting is finished, it's a good time to make sure the rib band fits comfortably over your hand (or your head or your hips depending on where it needs to go). 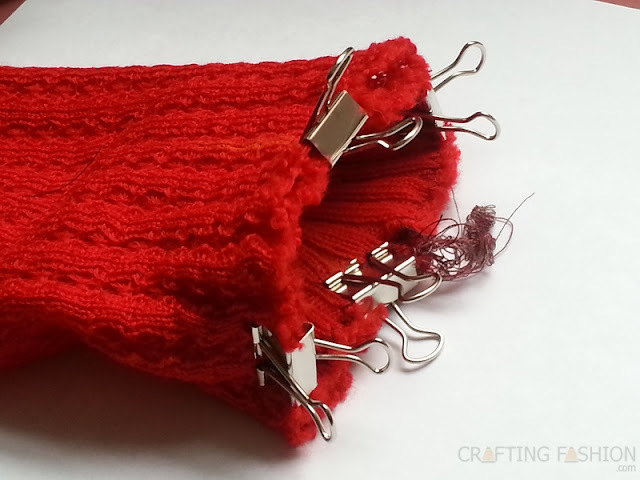 Use a color to match your garment, so you don't need to remove the thread later. Step 2. Mark the quarter points along the raw edges of the rib band and garment. Old fashioned tailor's chalk or felt tip fade-away fabric markers are great marking tools. First I make a mark at the inside seam of the rib band and from there determine the halfway point and then the quarter points. Repeat on the raw edge of the garment. Step 3. Pin the raw edges of rib band and the garment together. ...but ball point pins or t-pins are fine. Step 4. Serge (overlock) the raw edges. 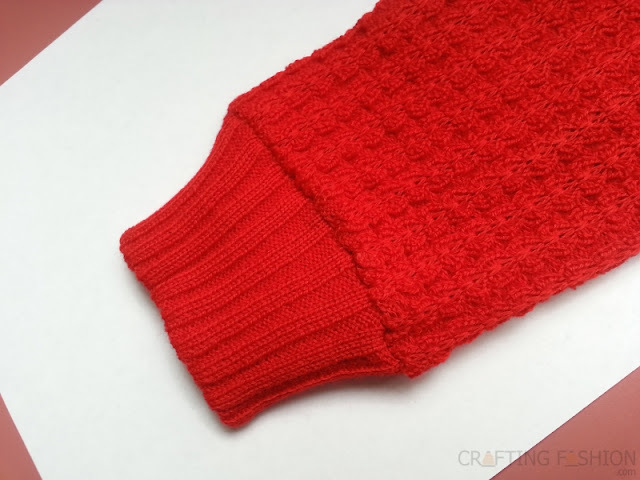 With the ribbing on top, stitch through all layers. You'll probably need to set your Differential Feed to about a "2" for a sweater knit. (Janome users, I actually set mine a click or 2 above "2", depending on the stretch of the fabric.) 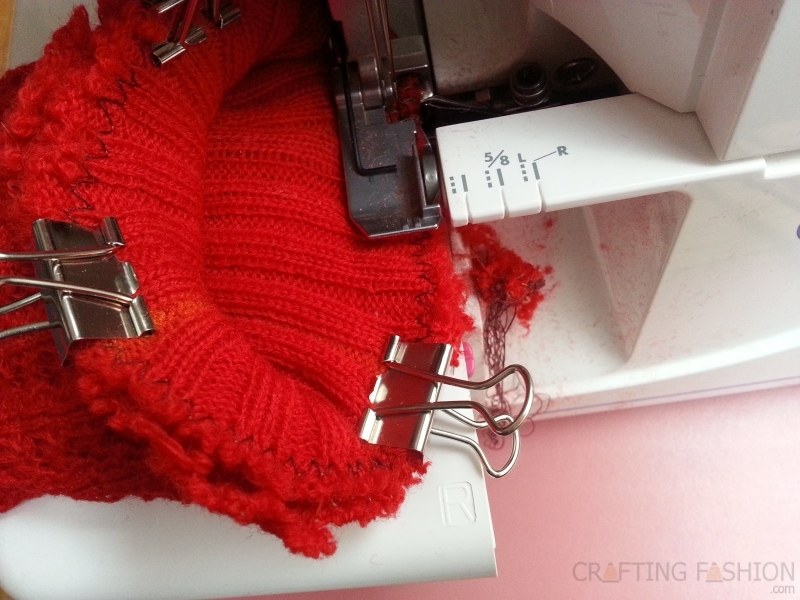 Use the zigzag to guide your stitching. Stitch just to the left of the zigzag. The clips are so big, it's impossible to forget to remove them. But if you're using pins, don't forget to remove them before you reach the knife! Steam the seam allowance in the direction toward the sleeve (or other main garment piece). (Optional) Top stitch the garment close to the ribbing seam (not pictured). If you decide to top stitch, it will look like the second and third pics in my Further Notes on the Providence Sweater post. Finished! Quick and not difficult at all! Pros add rib bands without any basting. I still baste occasionally. 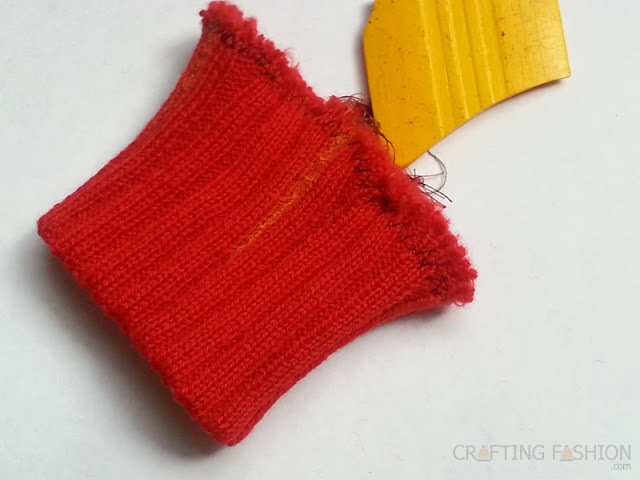 There are other ways to finish an edge of a sweater knit fabric. This one's probably the quickest and easiest, if you're want a "traditional cut and sew" look. If you've ever used this technique, please let me know in the comments what variations you used. 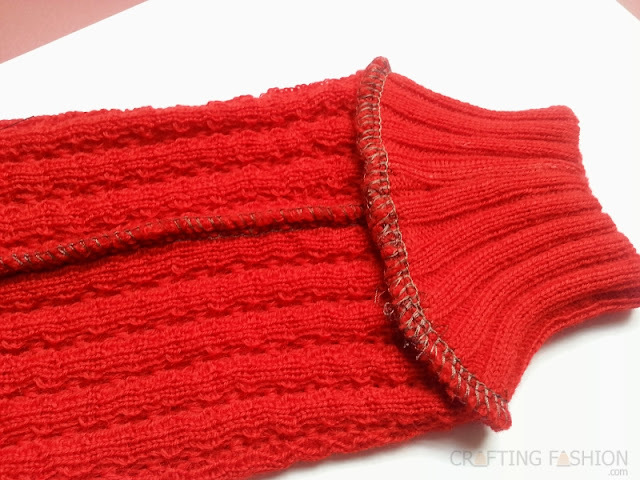 Also what's your favorite finishing technique with knits?